1. It has been nearly 20 years since the last installment into the George Lucas/Steven Spielberg franchise that solidified Harrison Ford as a Hollywood action star. For those that express concern and/or confusion over the prospect of a movie hero being dusted off and revived so long after the fact, we should remind you that the resurgence of the aged action star is but a new hot commodity in Hollywood. Otherwise, how does one explain the rousing success of recent return ventures into film franchises like "Rocky," "Rambo" and "Die Hard?" 2. Contrary to what many avid fans of this franchise might say, it is not the skill of the screenplay that drives this series, but rather the ability on part of the director and stars to fully embrace the absurdity of their premise and go full-force with cheese and kitsch. The Indiana Jones movie are above all else enjoyable because they are ridiculous, and completely joyful in being so. Once you keep that thought in mind, the idea of a fourth movie begins to work. 3. All ageist jokes aside, Harrison Ford really is in a different class than most of his contemporaries when it comes to retaining a youthful presence on screen. Other than his hair color and the deeper frown, no one watching the movie consciously thinks of him as being in his mid-60s, a virtue to a series in which the hero, even after time, is required to be physically able to withstand any obstacle that is thrown at him. 4. Shia LeBouf may be ordinary by young actor's standards, but boy does this kid have presence! Every time we see him in a movie, we are consciously aware of him and what he is doing. Did Spielberg recognize this as a virtue to his casting in "Kingdom of the Crystal Skull" because Ford's career is essentially structured with the same reasoning? Possibly. Either way, I'd gladly watch any number of Indy flicks beyond this point if LeBouf were guaranteed the spot of witty sidekick in all of them. It's an ideal match. 5. Cate Blanchett has effectively mastered the last remaining major accent of any serious actress' career, playing a Russian espionage agent here that is so savage in her pronunciation of the formulaic blockbuster catchphrases that we marvel at her ability to so easily disappear into her character both verbally and physically. Here is an Australian woman who has mastered accents ranging from New England, Brooklyn, Ireland, England, Poland and Germany, just to name a few. Is there anything left she hasn't tackled? Once upon a time I might have said something absurd like "I dare her to try and speak just like Bob Dylan," but oh wait, she's done that too. 6. George Lucas may be a good writer, but ultimately Spielberg is a better director, and watching this latest film, I couldn't help but wonder what the last three "Star Wars" pictures might have been like had its creator relinquised directing credits to someone more versed in the mechanics and style of the moving camera. Because this pairing seems so apt for the Indy franchise, perhaps Lucas ought to rethink his idea of finishing his epic series off with episodes 7 - 9, if only to see what kind of magic that a director like Spielberg could bring to it. 7. What a great day it is to see Karen Allen so effortlessly step back into the role of MaryAnn here, a character that has not been on the radar of one Dr. Jones since "Raiders of the Lost Ark." Indy has had amusing romances in between -- most notably, a fling with the ravishing Kate Capshaw from "Temple of Doom" -- but nothing has quite matched the magnetism of Allen and Ford, who bring a certain charisma to the notion of an unlikely romance that has routinely attempted to be replicated in similarly-themed action adventures like "The Mummy" and "National Treasure." As Marvin Gaye put it, ain't nothing like the real thing, baby! 8. So let's get this out in the open without beating around the bush. No, Sean Connery is not missed. In fact, one should be celebrating the notion that Dr. Jones' dear old dad is reduced to a mere photographic mention in this latest installment, as his presence in "The Last Crusade" was not the act of great genius. Both a distraction and a dizzying supplement to the comic relief of the prior Indy chapter, the idea of him is both annoying and unsettling in a series that sees no desire in probing the hero's family origins. 9. In attempting to write my full review of the picture, I realize that I have no idea of how to describe the plot. Is there one at all to begin with? If so, does George Lucas even know what it consists of? There are elements of espionage, cat-and-mouse caper, treasure hunting, creature feature and sci-fi epic all woven into the fabric of this story, done with such a high pitch of energy that one has to wonder if it all exists as such simply because both Lucas and Spielberg know they can get away with anything at this point. 10. The movie as a whole is absurd, preposterous, hilariously illogical and formulaic beyond belief. But it so ambitiously revels in those traits that no one is left unphased by the experience. 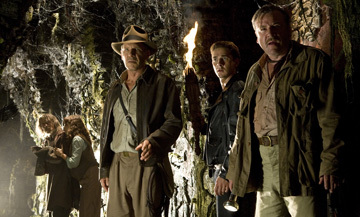 Indy has many great adventures in the film involving cities of gold, alien beings, giant crystal artifiacts and stories of ancient civilizations, but he has nowhere near the amount of fun participating in them as we do watching them. At every interval we simply want to throw back our heads and roll our eyes, but we don't because we are at a stage where everyone is at peace with this franchise's sheer stupidity. The point here is not logic or reason, simply joy and enthusiasm. And there's more than enough still left in Dr. Jones to justify this fourth film being released. Give me an aged archaeologist with a whip any day over a gun-toting secret agent sipping Martinis under the code-name of 007.